The Historic Mayfair Hotel LA, located at 1256 West 7th Street, is right in the heart of downtown Los Angeles and offers convenience to nearby attractions and plenty of vintage charm. 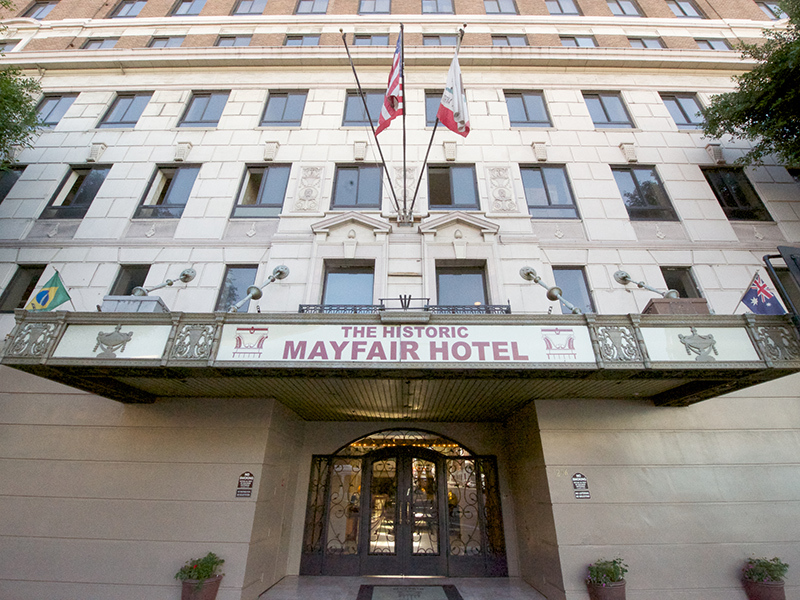 Built in 1926, the Mayfair boasts modern accommodations in a classic building. The Art Deco architecture and design details provide a unique setting that will elevate your LA stay with some old-school Hollywood glamour. Once the tallest building in west of the Mississippi, the Mayfair’s 15 stories house 295 rooms that include standard King, Queen, and Double setups, as well as European-style double Twin rooms and deluxe King rooms. There are also Junior and Executive suites available for those that desire more space. Junior suites have a living area, bedroom, and two bathrooms (plus a refrigerator and microwave), while Executive suites feature an additional dining room and kitchenette. All rooms come with access to free Wi-Fi. Cancellation or modification of any reservation is available up to one day prior to check-in for no charge. The Mayfair offers on-site parking with in/out privileges for only $14 a day. If you are traveling without a car, shuttle service can also be arranged to the Los Angeles International Airport and the Burbank Bob Hope airport. Additional accommodations include a breakfast buffet with hot and cold meal options, coffee, tea, and juice. The buffet is available from 6:30 a.m.-10:30 a.m. on weekdays and from 6:30 a.m.-11:00 a.m. on weekends. The price is $12.95 per person, with tax and tip included in the price. The Mayfair also offers special booking packages for stays of different duration and advance reservations, so check the hotel website before you book to take advantage of these deals. With its downtown location, the Historic Mayfair Hotel LA is conveniently situated for exploring the city. Both the Convention Center and the Staples Center are walking distance from the hotel, and the stunning Walt Disney Concert Hall is just a little over a mile away. Numerous theaters and museums are located in and around downtown, and there are also a vibrant array of restaurants, bars, and nightclubs within easy walking distance of the hotel. With only a short drive you can find diverse attractions such as the Los Angeles Fashion District, the Los Angeles Flower Market, Little Tokyo, and historic Olvera Street. There is also easy access to bus lines and Metrolink trains if you want to explore farther away parts of the city without a car. The Mayfair Hotel offers a unique opportunity to experience some of the charm and style of 1920s Los Angeles. The site of the first official Academy Awards after party and featured in many movies and TV shows, the Historic Mayfair Hotel LA has preserved its old-Hollywood cool while not sacrificing convenience and modern amenities. It offers a good choice of accommodations for anyone looking to visit LA and experience the up-and-coming downtown area. The Historic Mayfair Hotel LA is right in the heart of downtown Los Angeles and offers convenience to nearby attractions and plenty of vintage charm.